Colin MacKenzie (1754-1821) joined the East India Company as an engineer at the age of 28 and spent the majority of his career in India. He used the salary he earned from his military career as a captain, major and finally a colonel to finance his research into the history and religion of Indian and Javan culture. 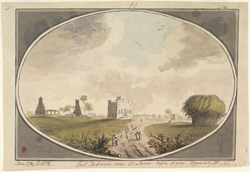 This painting is of the Tumkum, the country house erected by Tirumala Nayak that was built in the mid-17th century and earned its Fort Defiance moniker from its having been a defended outpost during the siege of Madurai in 1764. It was subsequently converted into the Collector's Bungalow.